Have you wanted to get a paddle board for a while now? After all, not only is it a great workout, but it can be a fun activity with the family. Not all of us can afford to drop four figures on a paddle board, though. Thankfully, there’s plenty of affordable boards out there that will get you out on the water and having fun for under $500! What is a Paddle Boarding? Paddle boarding is a fun and laborious activity connecting surfing and kayaking into one sport. It offers a fun, relaxing, and sometimes tiring way to have fun in the ocean or lake. Paddle boarding can also provide a great full body workout, because hey, this sure beats a gym membership! But whether you are using your hands and feet or a paddle, the sense of adventure will never let you down. To start, you are going to need a stand-up paddle board, a life vest, bathing suit or wicking clothes, a great SUP leash to connect you to the board, and sunscreen, so you don’t turn into a lobster. In our next sections we will be going over not only why to buy a paddle board to convince you some more, but also a helpful buying guide on the different sizes and types of paddle boards to help get you started. Why buy a Paddle Board? Life is short, and why the heck not? If you’re still not sure about paddle boarding, it is easier than you think. Although the price of paddle boards might scare you away, there are plenty of great paddle boards under $500 you can learn on. Also, paddle boarding is the perfect activity to ease your way into surfing if you’re particularly interested in that sport. Oh, and did I mention paddle boarding itself is a sport? Believe it or not, if you can stand up on a board and paddle, you can participate in incredibly fun competitions. Are you still not sold? We can still work with you; there are plenty of paddle board renting spots along any beach you go to. Remember, it’s a very popular sport. Try it out for a day; I’m sure you’ll love it. Now that you've chosen to be a paddle boarding pro, you may be asking yourself, where can I paddle board? The answer to that is simple; anywhere you can kayak, canoe, or do boating activities. Unfortunately, in most water sports you have to depend on a motor boat or the wind, but you lucked out on this sport! Just find a great beach or lake and push off. But be careful on the boating regulations in the are, some lakes and beaches prohibit some activities. But, most allow paddle boarding which makes it a very easy sport or activity to take part in. You can also follow many paddle forums online where they organize boarding events which can be extremely helpful for beginners. Speaking of beginners, let's go over the different sizes and shapes of paddle boards to continue your search. Paddle boards come in many shapes and sizes. When you purchase your first paddle board you first have to decide which one you want to go with: surf, allround, or flatwater. Surf paddle boards are smaller with a more narrow nose and are perfect for not only paddle boarding, but of course, surfing too. Although the narrow board makes it more maneuverable in the water, you have to deal with the consequences of it being slower and less stable. Next up is the allround board which is longer, wider, and thicker than any other board. These boards are better for beginners due since they are wider for a more stable paddle, but not ideal for surfer types due to its limited maneuverability. Finally, the flatwater or race board are specialized for ocean paddling with a more rounded look for a faster gliding and all around speed. This board is rarely recommended for beginners since it can be less stable and not the best for casual paddling. Should I Buy an Inflatable or a Solid Paddle Board? Besides choosing the most basic types paddle boards, you also have to decide if you want an inflatable or solid board. Inflatable Paddle Boards are made from PVC plastic and connect the top and bottom of the board with woven fibers. This type of board is lightest and much more portable. Solid Paddle Boards are made from either foam, fiberglass, Kevlar, plastic, or wood. These types of boards are not only heavier but harder to transport due to its many coatings especially if you purchase a wooden board. No need to inflate, just unpack from your roof rack, an GO! What to Look for in Buying a Paddle Board? The best things to look for when you buy a paddle board is your entire preference. You have to factor in what you will be doing with, where you plan to store, it how durable you want your board to be, and what kind of price you’re looking for. Never think price first when you buy a board. This is going to be a decent part of your life, and it's going to be an investment that you'll have for a LONG time. If you buy a board based on YOUR needs, than you'll be much happier in the long run. So, shop smart and plan long term. This inflatable stand up paddle board is perfect for anyone from beginner to expert. With a nearly indestructible build and a one year warranty, you are getting one of the best deals on the market. Not to mention the many colors you can choose from: seafoam, blue, green, grey, and black/red. Rolled out it measures 10’ x 30 x 6,’ and when rolled up it makes for easy portability when it measures to just 11 x 36.” Not only will this board last you for years but your friends are going to be extremely jealous. 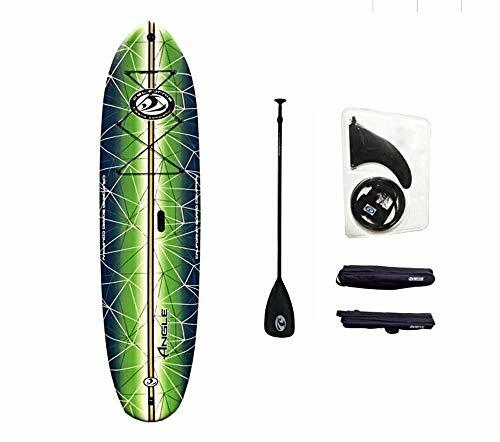 This Supflex inflatable paddle board is not only extremely durable with double layered military grade PVC and high psi, but this also makes it perfect for either beginners or experienced boarders. If you like customization, you’re going to love this company because this board comes in either blue, green, light blue, turquoise, or yellow. It can also be easily rolled up for quicker portability at 1’ x 33.” There’s also a lower risk when you purchase this board with the company’s 30-day money back guarantee and 2-year warranty. 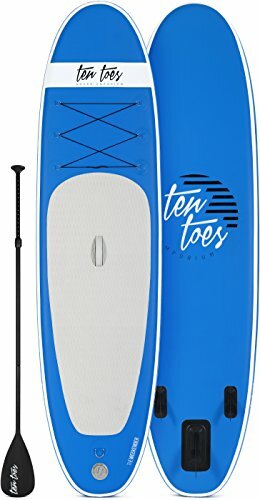 This solid stand up paddle board is great for beginners or experienced boarders who have a tight budget. Built from high-density foam for added strength and durability, is also 100% waterproof with a 30-day warranty. It can carry up to 300 pounds and comes with an exclusive tri-fin system for extra balance for beginners. The board also comes with a leash, so you don’t lose your board as well as a built-in camera mount for those Instagram stars out there. The board itself only weighs 25 pounds and is only a little over 10 feet making it easy to carry to and from the beach. 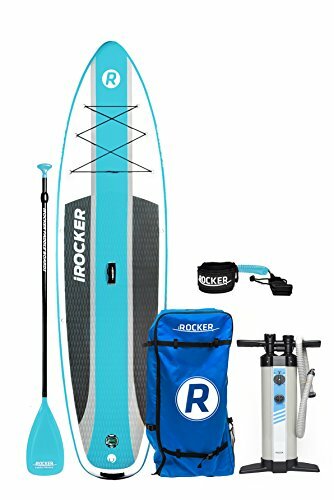 The iRocker inflatable paddle board is going to keep you rocking in the water! Built from military grade materials while still keeping its lightweight frame, it is perfect forboarders without cars for easy portability. One ofthe more unique features of this board is its high psi which gives it a much more similar feel to a solid board with no flex in the middle or loss of air when boarding. The board comes in an attractive blue or white color, including an air pump, paddle, and carrying bag. If you’re still unsure about this board, don’t worry, you’re covered by a 2-year warranty. 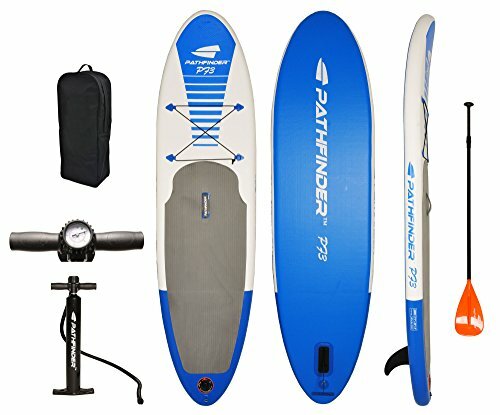 This Pathfinder inflatable paddle board is an excellent build with high-grade PVC and multi-layer drop stitch to prevent any rips or tears while boarding. Great for just about any weather condition, it has a larger deck than most boards, with a bungee for securing bags on the water. This board also includes an air pump, leash, detachable fin, shoulder bag, and valve wrench. For those beginners nearing intermediate territory, this board is made for you in mind. Want up to date SUP tips, tricks and reviews?